The 7mm Remington Magnum was introduced concurrently with the Remington Model 700 rifle and is one of the most commonly-available belted magnum cartridges. Ballistically it is more powerful than the 30-06 Springfield cartridge and uses a slightly smaller diameter bullet so the downrange trajectory is, in theory, better than the larger diameter cartridge due to lower wind drag. 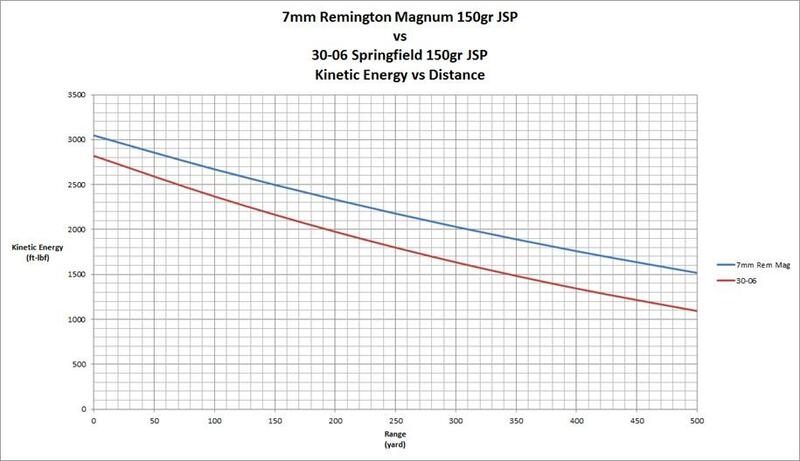 Let’s take a look at how the 7mm Remington Magnum cartridge compares to the 30-06 Springfield at extended ranges (see Figure 1). We begin to see the effect of the 7mm Remington Magnum increased sectional density as the bullets continue to move downrange. For convenience you can consider a bullet moving through air to be similar to an icepick encountering a piece of chicken—the faster the icepick goes, the more resistance is encountered during the penetration event. When air is moving at 2800 ft/sec past a bullet nose, it is in an incompressible state. The driving factors in overcoming this drag, then, is the area of the bullet presented to the airflow and the sectional density of the bullet. The longer (heavier) the bullet is for a given diameter, the less it will slow down in air or in gelatin. This low drag is more important when considering the drop of the bullet and thus the amount of hold-over which must be dialed in on the scope or estimated by ‘Kentucky windage’. 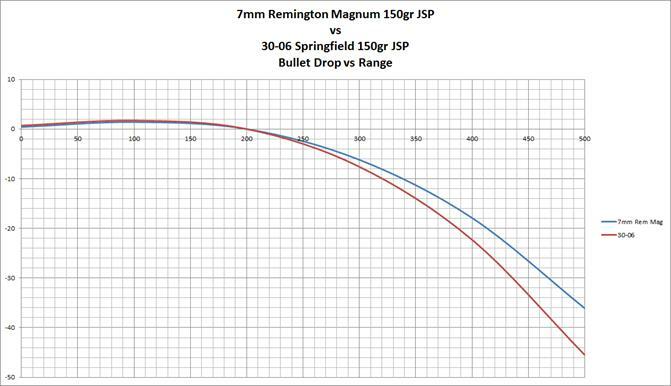 The 7mm Remington Magnum drops 20% less than the equivalent 150gr bullet shot from a 30-06 Springfield at 500 yards. Yes, it is true that the 30-06 starts off with 7% less kinetic energy. But we are focusing here on what is easily available for purchase in a store—the 7mm Remington Magnum is your off-the-shelf solution for increased precision at longer ranges. How does a reduced bullet drop help us hit the target at longer distances? Hitting a distant target requires raising the barrel of the firearm to compensate for bullet drop due to gravity. The most common way is to simply guess how far away the target is and then guess as to how much to hold the rifle over the target. When your uncle tells you about the gut-shot deer that ran away, it might be fair to assume that he incorrectly compensated for the distance and scored a wounding hit against the game animal. A more accurate method is to use a scope reticle that features some kind of bullet drop compensation. This better than holding over using the ‘guess’ method but the reticle is tuned for a certain ammunition type exiting the barrel at a certain velocity. The only way to know where your cartridge fits into the scale is to get out and shoot with the scope at the ranges labeled on the drop compensator. The best choice is the mil-dot reticle. It relies on a known target size to determine range. Once the range is known, then the shot can be dialed in with the quick adjustment knobs on the turret or you can hold over using the mil-dots themselves if you are in a hurry. 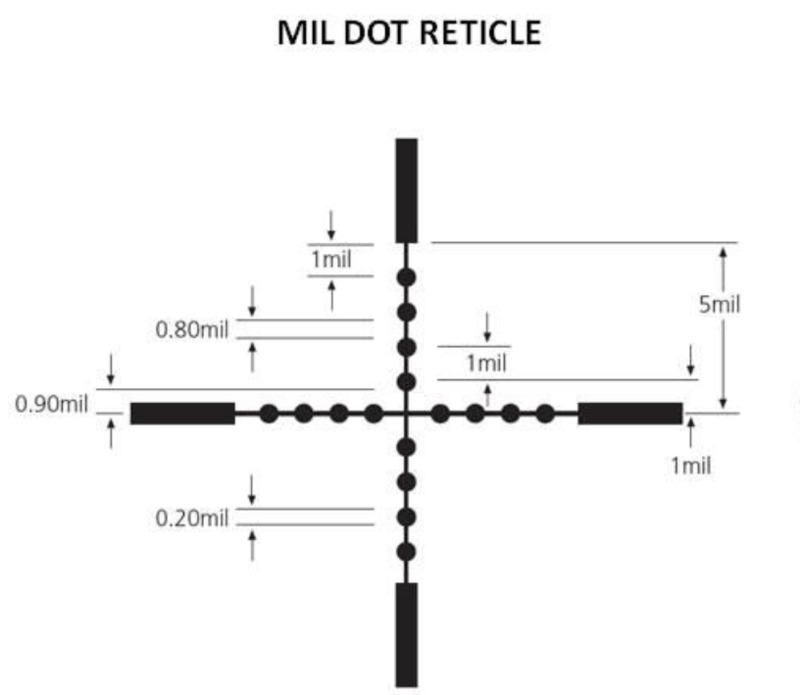 Not surprisingly, the problem with the mil-dot is that you must know how to use it before it is of any value to you. It’s a complicated system but well worth your time and money to invest in learning it. I recommend the 150gr expanding bullet for North American game animals and the heavier, limited expansion bullets as a minimum for protection from the larger bears.